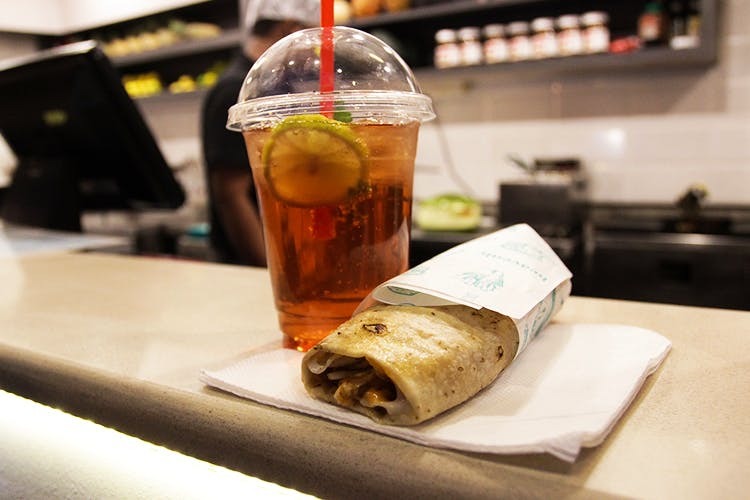 For all those snack ‘o’ clocks, Pout’s juicy shawarmas and crunchy falafel rolls are god sent for its flavour and price. You can also beat the heat and get a much-needed caffeine boost with their collection of Red Bull mocktails. The selection of Red Bull mocktails, well-cooked, juicy shawarmas, and falafel rolls. Situated just outside Dadi’s Dum Biryani, Pout is a colourful kiosk with neatly arranged fruits and a big shawarma spit. The lack of ambience is hardly noticed by anyone as most of the people who make up the crowd are college students who are grabbing a shawarma or two after class hours. We happen to pass by this kiosk on our way when we were instantly smitten by the sight of pieces of seasoned chicken stacked on a vertical spit. And since we were hungry, we ordered a shawarma and a falafel roll. The chicken was flavourful, grilled to perfection, and juicy. While could wax eloquence about the shawarma, but we’ll stick to how it was definitely better than most shawarmas you get around Koramangala. Oh, and these guys make the roll with roomali roti that’s sauced up with garlic mayo and spicy dip, and grilled. If we hadn’t ordered the falafel roll, we would have easily downed two more shawarmas. The roll was an instant hit with us for its taste and smooth texture. Our vegetarian pal loved how the spicy sauce added a kick. To wash down the flavour, we ordered a Blueberry Red Bull mocktail. While it did its job, it also gave us a much-needed massive caffeine rush. Red Bull is definitely not one of the healthiest options around, but once in a while it should be ok right? College folks, if you are pulling off late nighters, you definitely need to try this one out. Who knew Red Bull and shawarma could go so well, right? Well, we are definitely going back for them and the falafel rolls.